At Underpriced Furniture, we want to help everyone attain the bedroom of their dreams. In order to transform your home furnishing dreams into a reality, we provide an extensive collection of brand name bedroom furniture at prices unmatched by any other business in the area. Whether you are looking for a bed, a dresser, or a complete bedroom furniture set—we have literally hundreds of affordable options for you to choose from. 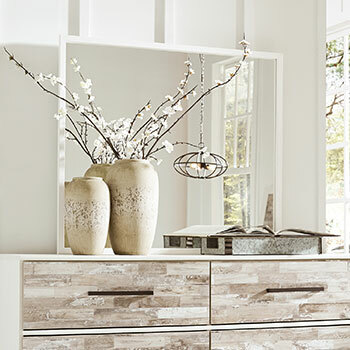 Learn more about all the great options we have to offer at our Norcross, GA home furniture store. When it comes to our bed selection, you can expect to find an array of options in a wide range of colors and diverse styles. If you prefer contemporary bedroom furniture, we have fashionable contemporary panel beds that feature elegant and streamlined designs. If traditional bedroom furniture is more your taste, we have traditional sleigh beds with distinctive wood panels and traditional upholstered beds that feature button-tufted headboards and sophisticated dark wood finishes. No matter what type of bed you choose, you can count on it to be stylish, sturdy, and reliable. To further enhance your bedroom décor, we provide a large collection of versatile bedroom storage furniture including dressers, nightstands, and chests. We have three and four-tier dressers for sale that are perfect for storing your clothing and linens, and compact nightstands that provide room for your smaller daily necessities. We also have media chests that include a space for your television and electronic appliances, as well as a set of spacious drawers for additional storage. If you are in search of a truly great furniture deal, you may want to browse our collection of complete bedroom furniture sets. Our complete bed sets include a bed, a mirror, and a set of bedroom storage furniture, all for one conveniently low price. 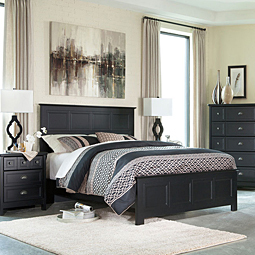 Purchasing one of our bedroom furniture sets will save you money and simplify the entire furniture shopping process! To see our complete collection of bedroom furniture, browse our catalog online or visit our Norcross, GA furniture showroom. We look forward to working with you!